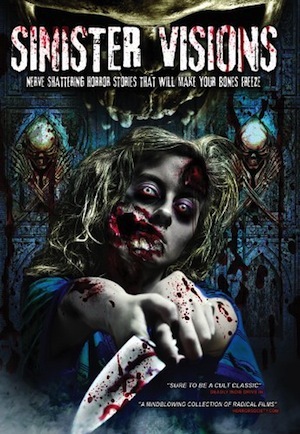 New this week from Chemical Burn Entertainment is the horror anthology Sinister Visions. SUCCUBUS - We find a beautiful young blonde, Emma, studying to become an archeologist. On an excavation trip to Syria she finds something in the sand that is about to change her life completely. She hurries home hoping to be able to escape it, but she might be too late to change her fate. MY UNDEAD GIRLFRIEND - A twisted tale with a lot of morbid, dark humor, telling the story of the day Keith woke up next to his girlfriend who had spontaneously turned into the flesh eating undead and tonight he is about to meet her parents for the first time! MOTHER KNOWS BEST - Carl is a somewhat shy man preparing for a date with his childhood sweetheart, Rebecca. Carl's mother has quite a few objections to the date and she is none too shy to express them in her own special way. A WOMAN SCORNED - Gail gets tied to a bed by Holly. Gail had the nerve to start a relationship with Richard, who unfortunately is Holly's former husband and Holly does not approve at all! GENITAL GENOCIDE - Meet Serial killer Charles Albert Harris, who on death row waiting for the switch to be turned on, takes us through his crimes while the audience of friends and relatives of his victims listen in shock. Sinister Visions is available now on DVD.